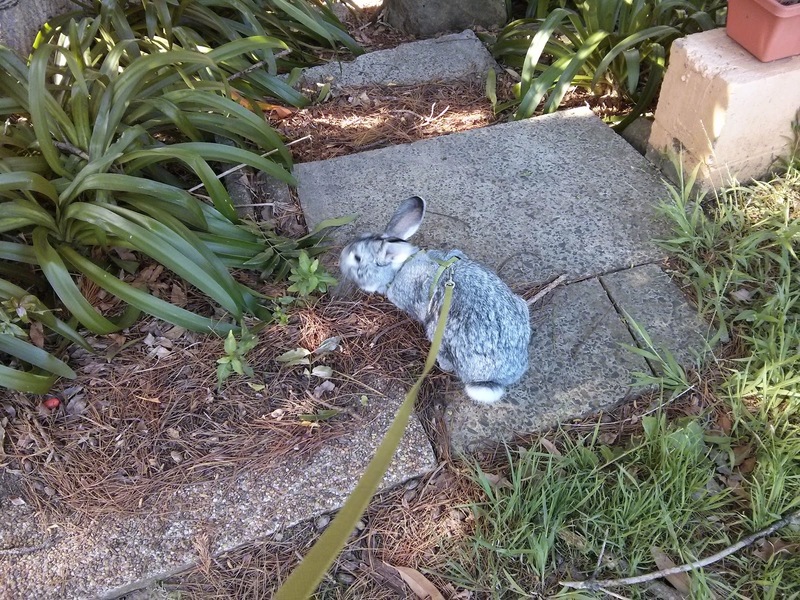 Sharing some exciting news with all of you - we are now owned by a rascally rabbit, called Cicero. 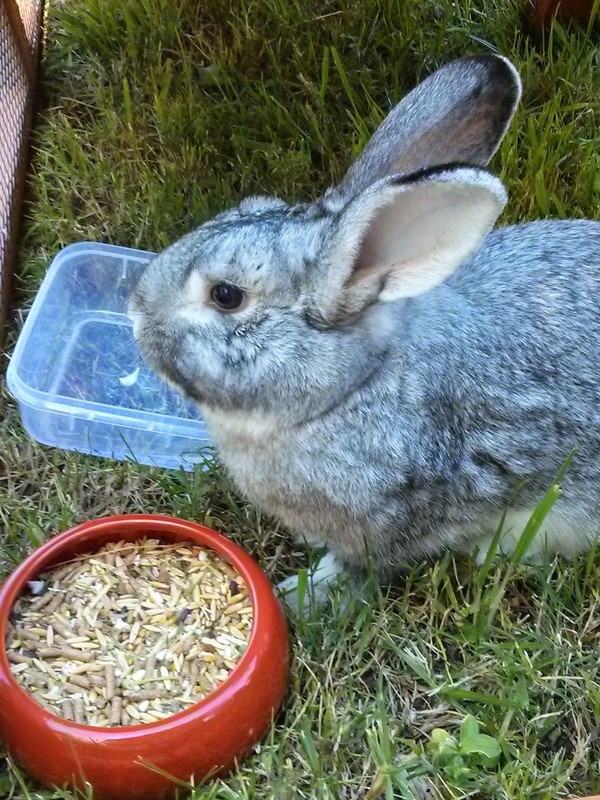 He has an interesting history, but we have no idea what it was before he was brought into us at Russell Vale Animal Clinic as a "lost bunny". He came in on the day of our Open Day, 13th September 2014. He was with us for a few days and was posted on a few Facebook Lost and Found pages, including our own. As no one came forward to claim him, he went to the local RSPCA, as we knew that this was going to be his best chance to be reunited with his original family. I know that he must've been loved, as he was already desexed, and is a very tame man. The RSPCA staff at Unanderra kept us informed the entire time about his welfare, and for this we are forever grateful. And sadly, no one came forward to claim him as their own, or to choose him as the newest member of their own family. Now we are back to building our menagerie again. He is now with us, has joined our family, and we have called him Cicero. Check out his new digs! 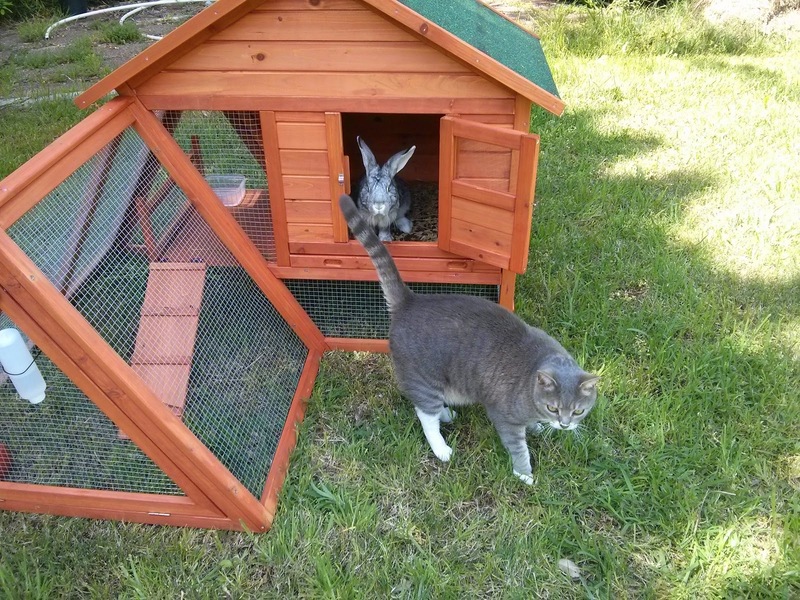 Cicero showing off his new house to our cat, Pusski. It is a split level home, like ours. A big area on the bottom with shade and open - ness. Since the photos were taken, we have since added mosquito netting to protect him from myxomatosis (spread by biting flies and mosquitoes). He is already vaccinate against Calicivirus (having had that done at the RSPCA). He will get this vaccination every year, with his annual dental check and blood work. 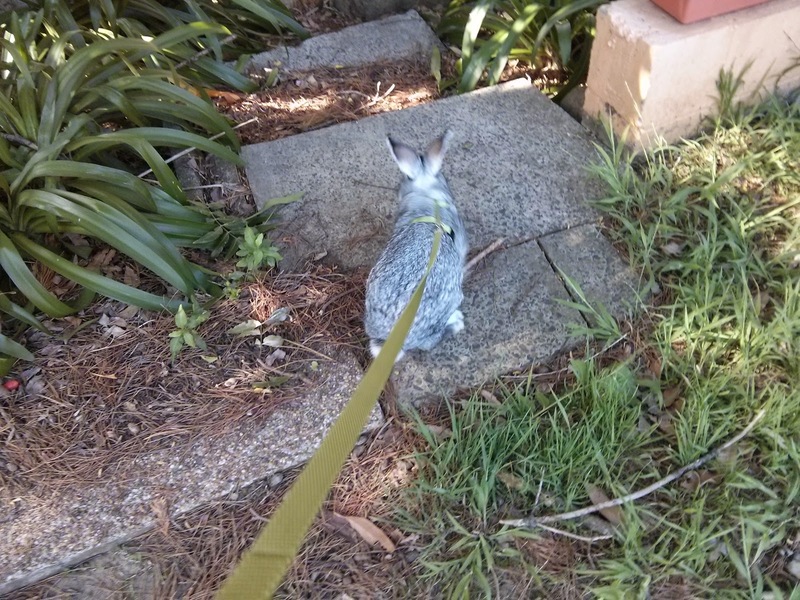 We have bought him a rabbit harness, as we don't want him running away (there are dogs on either side of our property, and as we back onto the RTA land, there are foxes in there. We want him to have fun with us outside too, but know that he is safe. In all that I know, have read, or have had lectured to me about rabbit health, there was one point that always stood out. 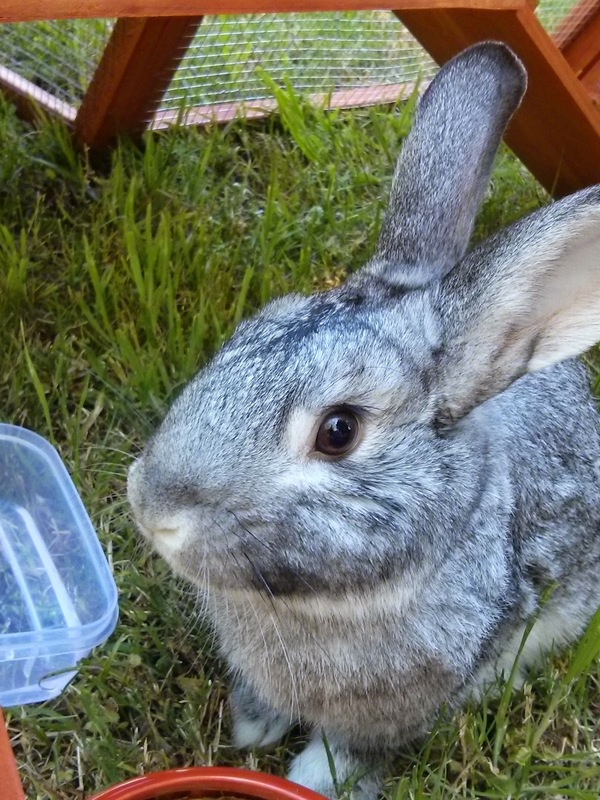 What food a rabbit eats is the single most important part of a healthy rabbit. Ensuring an appropriate diet can prevent many diseases, such as those involving teeth, their gut and their skin. The problem with many commercial rabbit foods, is their fibre content. 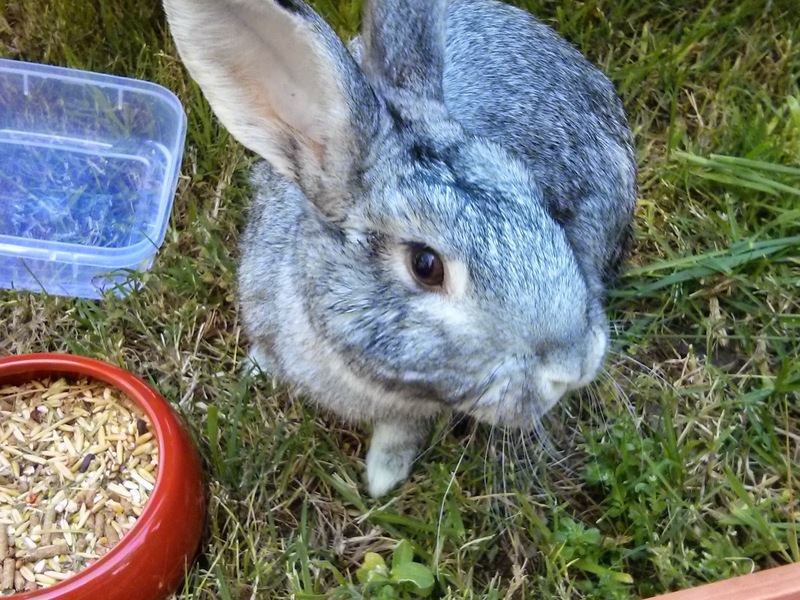 A rabbit food needs 18 to 20% fibre, and their digestive system is designed to eat grass for 6-8 hours a day. He eats a "keep it simple" diet - this is the best thing for him. Oxbow Timothy Hay - the reason why I choose this, is that it is lower in protein and calcium than other hays, but equally higher in fibre. 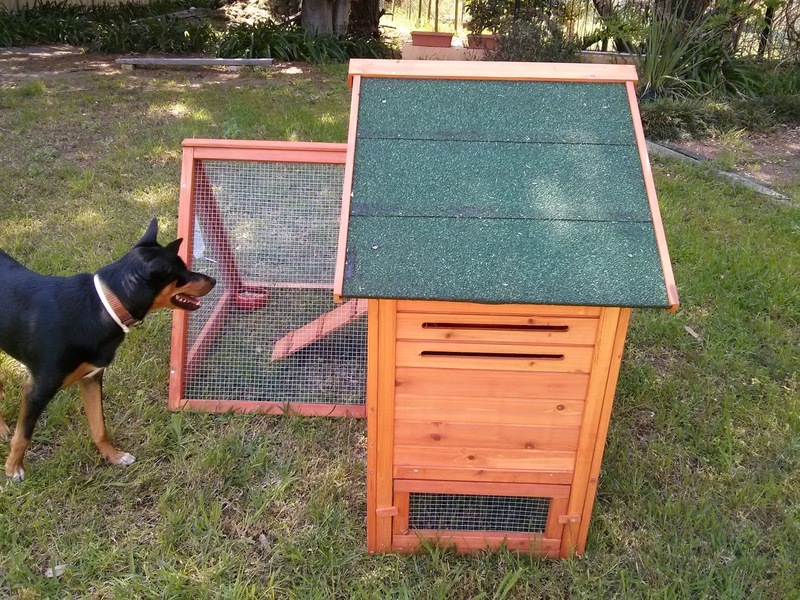 This will help keep his digestive tract as healthy as it can, as well as prevent urine crystal or bladder sludge (a common problem in house rabbits). This type of hay will encourage a lot of chewing, which is what rabbits need for their continuously growing teeth. To my surprise, we had a lot of trouble sourcing this through the local pet shops, but we know that this is the number one food recommended by vets who specialise in exotic pets, like Cicero. Vegies - access to plenty of fresh grass. He gets this daily. He gets 1 packed cup of mixed veges - we include - carrot tops, brussell sprouts (see there is a use for them), spinach leaves, bok choy. Rabbit pellets - the problem with many commercial rabbit pellets is that they contain insuffient fibre, so we make sure that when we went shopping, we looked for a high fibre, low calcium pellet. We couldn't find one locally, so we are using a normal commercial one for the time being, but we will be ordering it online, as well as stocking it for our fellow bunnies. Herbs - he gets a tablespoon or more of mixed herbs - dandelion (we have lots growing naturally), parsley, basil, dill or mint. And who doesn't love a treat or two. We give him chopped up banana or apple (but no more than tablespoon) each few days. Because we want our (and your rabbit) to have the very best, we will be stocking a range of Rabbit and Guinea Pig food from Oxbow. The usual barking and carrying on initially, but she has now adjusted to the idea. 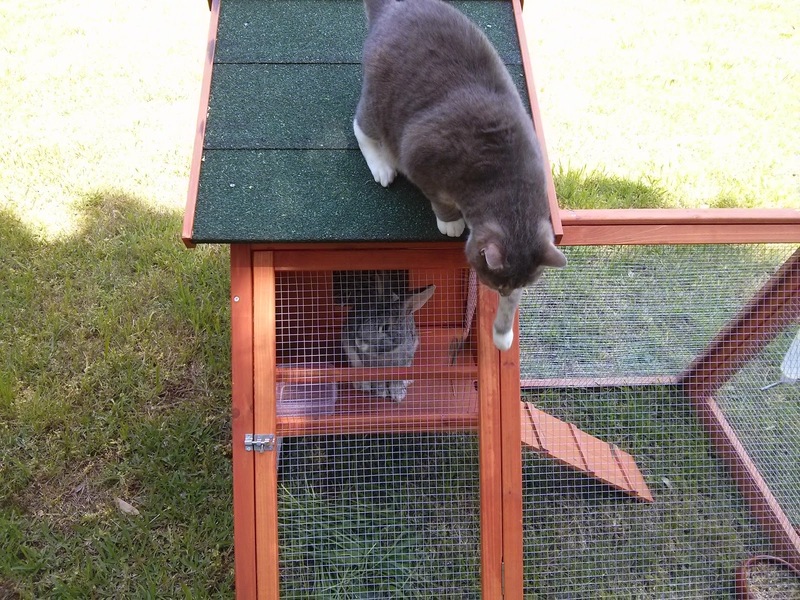 She alerted Dirk on the first day (Cicero escaped from the old rabbit hutch we had). Cicero was sitting there, with Piper barking at him. Neither one moved. If Cicero had run, then Piper would have too. As Cicero did not move, neither did Piper. Phew! Just as well. A rabbit running from a kelpie would not have been a fun situation for Cicero at all, and certainly not we would have intended for him on his first day. So, we welcome Cicero to the mad household of Dr Liz and her animal mad family. I am Dr Liz, the mad vet of Bellambi. Welcome to my family. Our Dog Piper - Turning One!